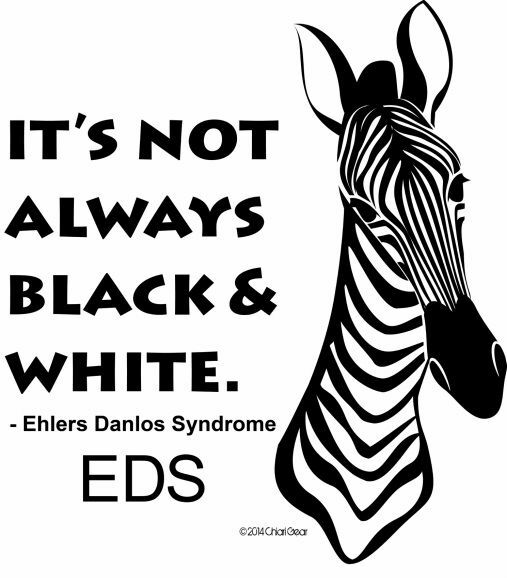 Ehlers-Danlos syndrome (EDS) is a collection of inherited conditions that fit into a larger group, known as heritable disorders of connective tissue. The Classical Type of EDS is characterized by highly elastic, soft, and doughy skin; unusual scarring; and loose joints. People with Classical EDS may have: joint hypermobility, loose, unstable joints that can lead to dislocations and subluxations (incomplete or partial dislocation of a joint), stretchy (hyperextensible) skin, fragile skin that can split easily – especially over the forehead, knees, shins and elbows, smooth, velvety skin that bruises easily, wounds can be slow to heal and leave wide, papery scars, in rare cases, there may be problems with the veins and arteriesfragile and stretchy tissues can also result in hernias and prolapse. The Hypermobility Type of EDS is characterized by loose joints and chronic joint pain. The Vascular Type of EDS is characterized by possible arterial or organ rupture as a result of spontaneous rupture of vessels or organs due to the result of even minor trauma. The Vascular Type of EDS is the most serious form of Ehlers-Danlos Syndrome. The Kyphoscoliosis Type of EDS is characterized by generalized joint laxity and severe muscle hypotonia (weak muscle tone) at birth. The Arthrochalasia Type of EDS is characterized by congenital hip dislocation which is present in all biochemically proven individuals with this type of EDS. Severe generalized joint hypermobility with recurrent subluxations are seen in individuals with this type of EDS. Other manifestations of this type may include, Skin hyperextensibility with easy bruising, Tissue fragility including atrophic scars, Muscle Hypotonia, Kyphoscoliosis, Radiologically Mild Osteopenia. The Tenascin-X Deficient Type of EDS is characterized by joint hypermobility, hyperelastic skin, and fragile tissue. Lacking multiple shrinking (atrophied) scars in the skin that is often seen in the Classic Type of Ehlers-Danlos Syndrome. Inherited as an autosomal recessive genetic trait (not seen in family members or only in one generation of members of the same family). It’s also important to understand that even if you have a certain type of EDS, it does not mean that you do not have Vascular problems. One can even have a mutated gene from one parent combined with another mutated gene from another parent and have both types. There is a 50% chance of even passing the mutated gene on.